Vintage sounds in a practical package. 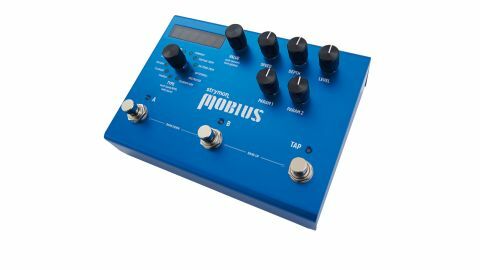 The focus with Strymon is on immaculately-modelled emulations of old analogue effects, and its Mobius tackles a wide range of modulation effects from the last five decades, but offers them with extended versatility. "Variations on 12 different effects are stored in 200 presets"
There are loads of editing possibilities from a nicely laid-out set of knobs that lend themselves to quick onstage tweaks. Variations on 12 different effects are stored in 200 presets, with instant access to two presets in a bank via a pair of footswitches, the third footswitch providing tap tempo, while banks are changed by pressing two footswitches at once. With a more accessible user interface, the Mobius is a class act that gives the ModFactor a run for its money.